In Picturing Casablanca, Susan Ossman probes the shape and texture of mass images in Casablanca, from posters, films, and videotapes to elections, staged political spectacles, and changing rituals. In a fluid style that blends ethnographic narrative, cultural reportage, and the author's firsthand experiences, Ossman sketches a radically new vision of Casablanca as a place where social practices, traditions, and structures of power are in flux. Ossman guides the reader through the labyrinthine byways of the city, where state bureaucracy and state power, the media and its portrayal of the outside world, and people's everyday lives are all on view. She demonstrates how images not only reflect but inform and alter daily experience. In the Arab League Park, teenagers use fashion and flirting to attract potential mates, defying traditional rules of conduct. Wedding ceremonies are transformed by the ubiquitous video camera, which becomes the event's most important spectator. Political leaders are molded by the state's adept manipulation of visual media. 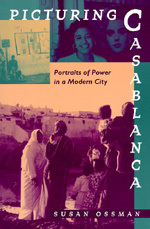 From Madonna videos and the TV's transformation of social time, to changing gender roles and new ways of producing and disseminating information, the Morocco that Ossman reveals is a telling commentary on the consequences of colonial planning, the influence of modern media, and the rituals of power and representation enacted by the state. Susan Ossman is Professor of Global Studies and Anthropology at UC Riverside.